Tiene como objetivo promover la lectura en nuestra comunidad. Inicialmente, estamos desarrollándolo con estudiantes de 6to a 12avo y maestros que quieran participar. Se alternan libros en inglés y español. No es necesario comprar el libro. La lectura también se puede hacer en Kindle, PDF. Sonia Sotomayor’s autobiography is an inspiring story, one that could encourage many young people to work toward success. She honestly describes her difficult childhood, living in a low-income family in one of the slums of New York. She had to overcome many things, in order to advance to being worthy of her appointment by President Barack Obama to the United States Supreme Court. The greatest aspect of this memoir is that it reveals Sotomayor’s internal thinking, her self-doubts, her challenges, and how she learned new skills. She credits the many teachers, mentors, and friends who helped her advance in life and in her career. 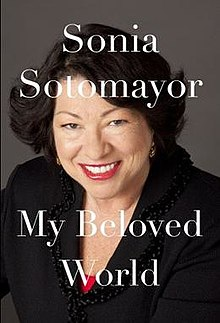 Sotomayor’s parents were from Puerto Rico, and they did not speak English at home. Her father was an alcoholic, and he died when Sonia and her brother were in grade school. Their mother worked as a nurse, leaving the children under the care of their grandmother. Another major challenge for Sotomayor was discovering at about age 8 that she had Type-1 Diabetes. Amazingly, the little girl immediately learned how to inject her own insulin. Language differences, poverty, family troubles, serious illness – a host of problems could have kept her down. The narrative focuses on her travels through childhood in Catholic school, college at Princeton, Yale Law School, and her early employment as an attorney. She outlines the thoughts she had and the ways she learned to survive in all these maturing experiences, but the book deliberately does not go into her recent work as a judge in depth. She is the first Hispanic and only the third woman to be appointed to the U.S. Supreme Court. As an adult, Sotomayor also dealt with relationship problems, including a difficult marriage and some work experiences where men treated women unfairly. She learned how to respond to various conflicts, how to adjust her thoughts and her speech to accomplish desired results.